I'm an Introvert - Can I Be a Mastermind Group Facilitator? I’m an Introvert – Can I Be a Good Mastermind Group Facilitator? I get this question all the time. 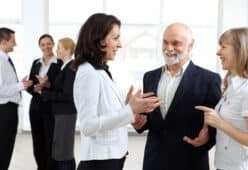 People figure if they’re shy, or if they need to rest after being around a group of people, that they’re not cut out to lead a mastermind group. I’m happy to admit that I’m an introvert myself, and I’ve been creating and running mastermind groups since 1995. If I can do it, so can you. Maybe we should first define “introvert,” right? Being an introvert doesn’t necessarily mean you are shy. What it means is that you draw your strength from your internal self, not other people. While extroverts gain energy by being around people, introverts expend energy by being around people (which means you need a rest break after your mastermind group meetings). Introverts are strong. They rely on their own internal intelligence to perceive things clearly. They’re great in small groups, like a mastermind group. Even Forbes Magazine says that introverts make great leaders. The best part about being an introvert is that you keep your eyes and ears open to what’s around you, you can absorb and process a lot of input, and you don’t talk unless you have something worthwhile to say. All great traits of a mastermind group facilitator. Check out this great article on 10 Myths About Introverts. Then go out and form your group! Thank you for this article and the links. I’ve always known that I am an introvert but I had no idea that we were in the minority. I absolutely love this description. “While extroverts gain energy by being around people, introverts expend energy by being around people”. It so explains why my Wednesday’s are so exhausting – morning networking group and evening Toastmasters meeting. Karen, I read an article that said introverts made up 20-40% of the population. Explains a lot, doesn’t it? I totally agree. I used to have a big staff and would strategically position my Introvert team members to chair meetings. So much more balanced discussion that way! Introverts are good facilitators, Cathy, because they ask the group to pause and consider things deeply.